Often tour operators and service providers with in-house systems have no connection to CRS/GDS systems and therefore cannot offer their product range to the travel agency market. A connection to the single CRS/GDS systems so far was very time- and cost intensive. A modern and elegant alternative for this is DynaGate®. An individual adapted Gateway Frame that is connected with the in-house system and that communicates with all established CRS/GDS systems. By implementing DynaGate®, tour operators and service providers are in the position to realise their desired CRS/GDS connection simply without complex system changes. The individual booking procedure is pre-configured in DynaGate® and it is ensured that all booking-relevant data is transferred in the correct way to the Mid- and Backend systems. It includes vacancy reply in real time and an automatic data handling, without any manual data handling. For every terminal number, a session will be established after a message receipt, in which the information during a complete process will be buffered. The necessary buffer of information for the processing of message formats is therefore already integrated in DynaGate®. With dynamic interface definition, DynaGate® analyses the formats of incoming messages and splits them into pre-defined single information. Afterwards the application of rules will follow, which indicates the data flow sequence of different actions in a XML configuration. The single information builds the basis for the impulse of actions here. 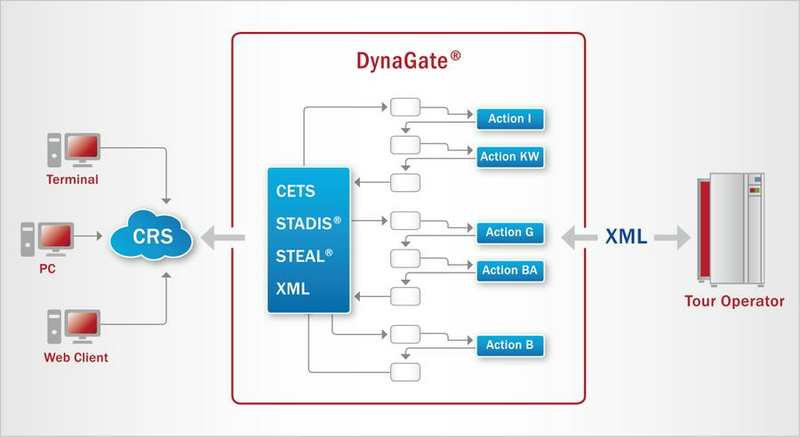 For a TOMA®- or GDS connection, DynaGate® functions as CRS/GDS Gateways. The elements of the existing tour operator system and the single configuration pre-settings are analysed and defined individually together with the customer during a workshop. In case a CRS Gateway already exists, the received information will be communicated to the existing gateway during the connection of dynamic part-templates. For the reply, the procedure is analogue. The information received from the existing STADIS® Gateway will be splitted and will be presented as reply to the terminal in the desired format. Via XML configuration and based on this systematics a dialogue with internet-booking applications can be established. The booking will be even more comfortable with the dynamic part-templates in STEAL®- or XML format for the established CRS applications. They support the product consulting, optimise business processes and simplify the booking procedure. By the utilisation of DynaGate®, the applicant has several advantages, for example the optimised TOMA® booking dialogue which is immediately available. With DynaGate® these new part-template technologies can be easily implemented. By upstreaming the adapted Gateway Frame, complex adjustments to existing gateways are unnecessary. The technical basis is the part-template technology, which enables the user to finalise a booking without previous knowledge, since no “cryptic” abbreviations have to be entered into the CRS template. The user is leaded step by step through the complete booking process and all necessary procedure details will be changed automatically and are transferred into the CRS main template to close the booking. The tour operator has the possibility to guide the travel agent through single booking steps by means of selective pre-setting of the navigation line and activating of follow-up part-templates. Dynamic part-template groups support and simplify the consulting- and booking process for touristic products. Vacancies and alternatives are shown convenient as selection lists. Desired services are taken over via mouse click. Two work levels are available for the user: The expert mode for precognition or the beginner mode (guided mode), guiding the user well-directed and without further trainings through the complete booking process. The dynamic Gateway Frame developed by znt Richter is a basic application, by which means an individual Gateway can be implemented quickly via configuration. On this basis DynaGate® has been developed, a gateway frame especially for touristic interfaces. New CRS/GDS connections will be adjusted to the customer system individually. DynaGate®, which is developed by znt Travel is the basis for the integration of the DRV Request Interface and supports the usage of the new search logic form Amadeus TOMA®. All fitting data structures of each category for “Request” and “Response” are defined in the interface and the delivered products have all relevant data to book the products via the STADIS® format in Amadeus TOMA®. 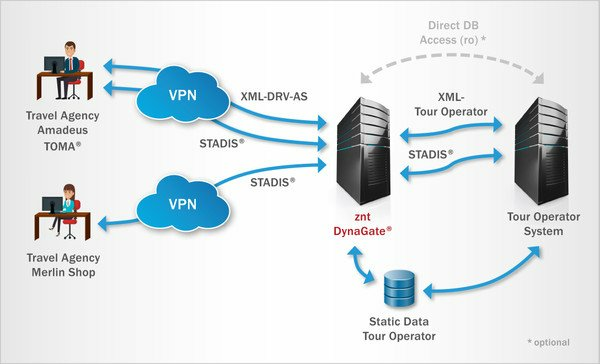 The DynaGate® Router will be integrated between the existing VPN-Gateways of STADIS® based CRS Systems (Amadeus TOMA®, Sabre Merlin, etc.) and a XML Webservice. Receiving and Transmission of various STADIS® and STEAL® data formats with the DynaGate® Router. 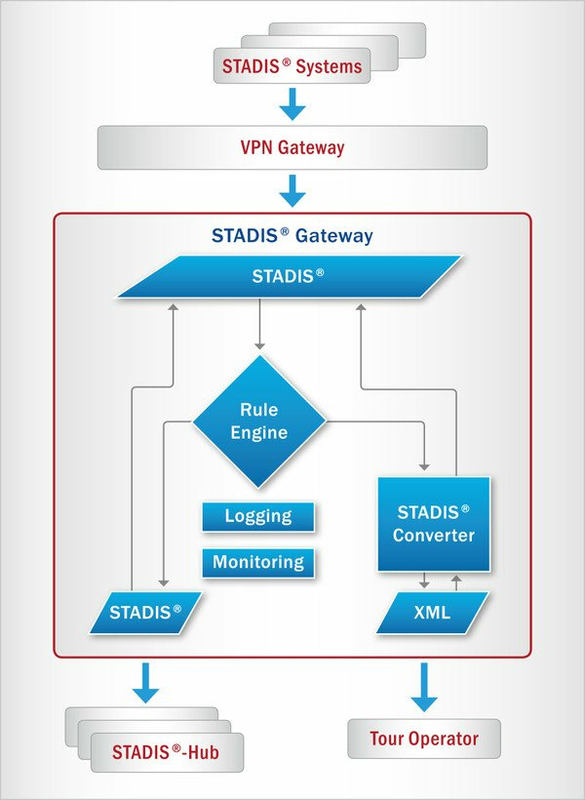 For the transmission of the incoming STADIS® data from the single CRS Systems the protocol TCP/IP is used. The routing of the data is via a XML-Webservice. The Webservice can receive the original STADIS® data as packed or as an unpacked format. Within the transformation in the DynaDataGen all conditions, rules, combinations, price details and price rules of the products are reproduced and prepared for the further usage for the tour operator.